James Acord's Leather. 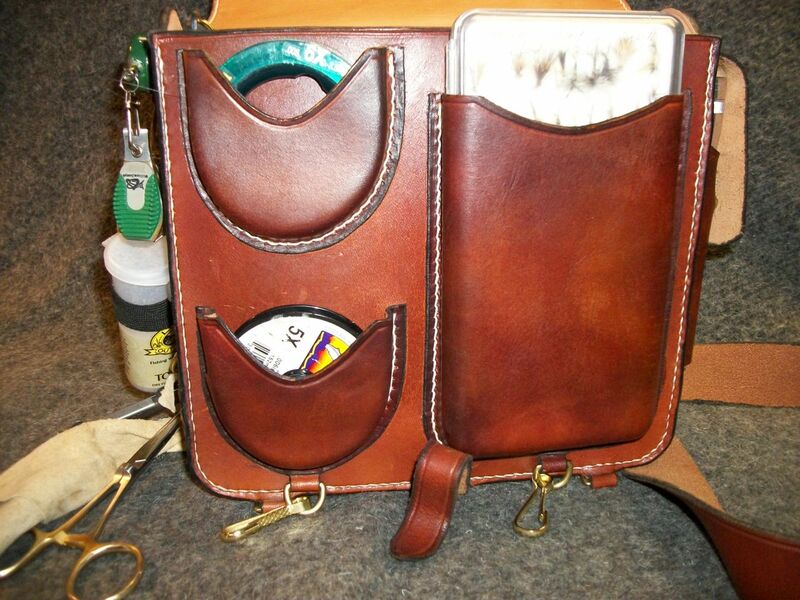 All hand made fly fishing equipment cases, all custom orders made entirely by Jimmy Acord. Salmon, Fly fishing art. 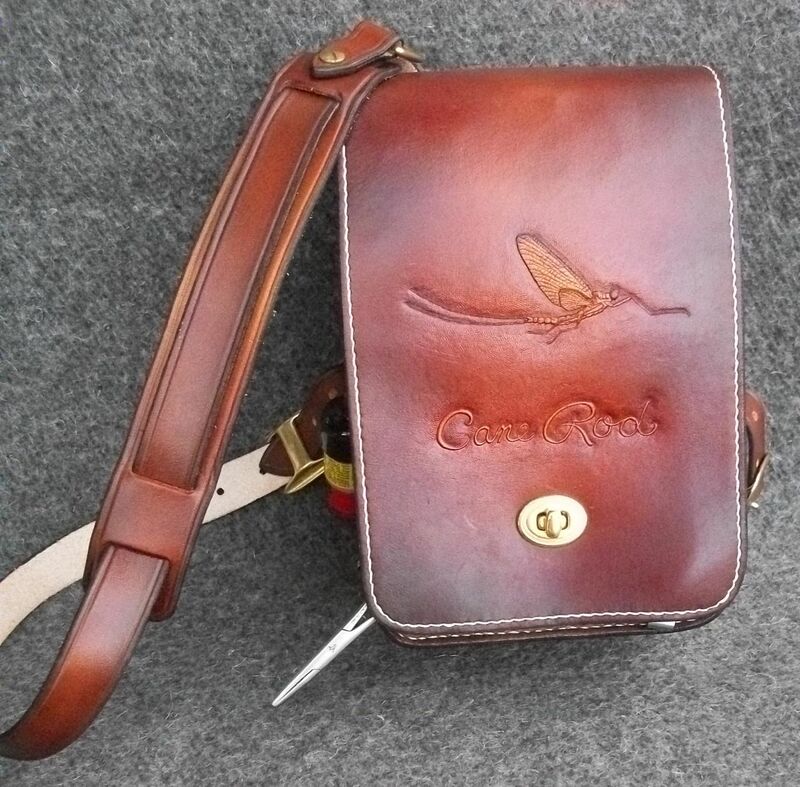 Upland bird and water fowl, sporting dogs, Custom order,collectible fine crafts, gifts, personalized nature images, corporate logos on flasks, rodcases, reel cases,fly cases, cigar cases, unique custom orders, fly fishing equipment cases, custom order, all processes done by hand. Collectible heirloom quality functional art cases for the fly fisherman, upland game bird hunter, and water fowler. 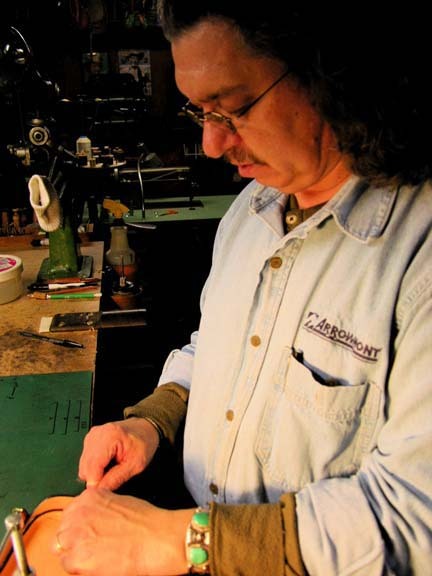 Each custom ordered piece is uniquely designed and handcrafted from start to finish by James Acord. 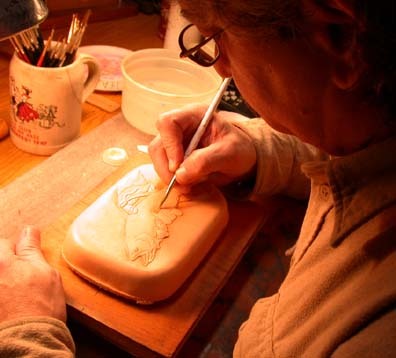 Above photo: Jimmy carefully brushes a protective sealer over parts of an image he's carved into a leather case top which he's molded into his trademark clamshell shape, before he paints and dyes the fish, hand, and case background. Jimmy will assemble all the handmade parts and hand sew the case after he finishes the artwork on it. As always, this case is a custom, one of a kind order, made especially to a customer's wishes. The man's initials are hand carved into the design of the bottom part of the case, not shown here. This is very unique, heirloom work, which you can order to be designed and made just for you. 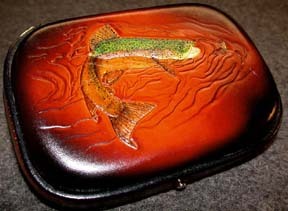 Custom Fly Fishing Cases, Flasks, Salmon Fly Art, and Other Handmade Specialties. 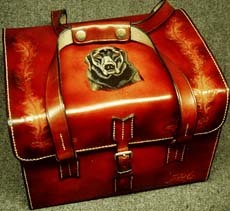 Welcome to James Acord's web site for his custom made leather work. 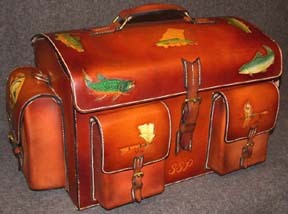 The specialty of the house is classic fly fishing cases, made to order for your rod, reel, or flies. 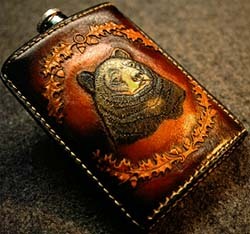 Jimmy also makes custom flasks and cigar cases. The hallmarks of his work are meticulously drawn, tooled, and then painted images from nature, elegant hand stitching, and a rich antique look and feel to all the surfaces. All the processes are done by Jimmy alone, not in cottage industry or assembly line style, but carefully, lovingly. Each piece is hand signed, dated, and numbered. Your case will be a cherished heirloom for generations. In this photo, Jimmy hand sews one of his clamshell style fly cases together. All his work is handsewn, not using machines. This is not a cottage industry, but a one-man operation. 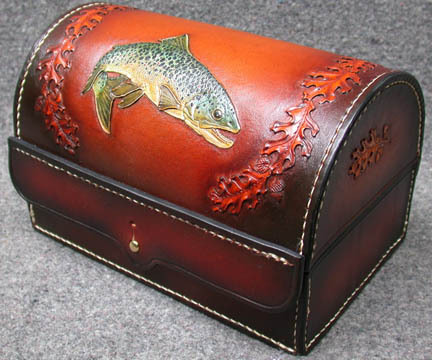 This may be the only place in the world where you can still custom order fine crafted leather fly fishing cases and know that only the one craftsman you order from works on your project from designing the patterns up through finishing the work. And he does it all by hand, in the traditional ways. He'll be the person you work with directly when you call or send emails, so you'll enjoy full personal treatment, besides buying the best in custom leather work. My Custom Order Wait List now goes into Fall and Christmas, 2019. And I am happy to sell gift certificates for Christmas and for all occasions. To put your order in line, email or call me to discuss what you want. When we settle on a price and you've send your half-down deposit, your order has its place on my wait list. Besides taking an order for you, I can sell you a gift certificate for someone else, which will give your recipient a place on my waiting list, and is really nice for if you're not sure what to custom order for someone else. This way, they can discuss their custom order with me, for the amount you've given them, or they can add more money to it to get something extra. Here's a nice article about my work, from 2012. 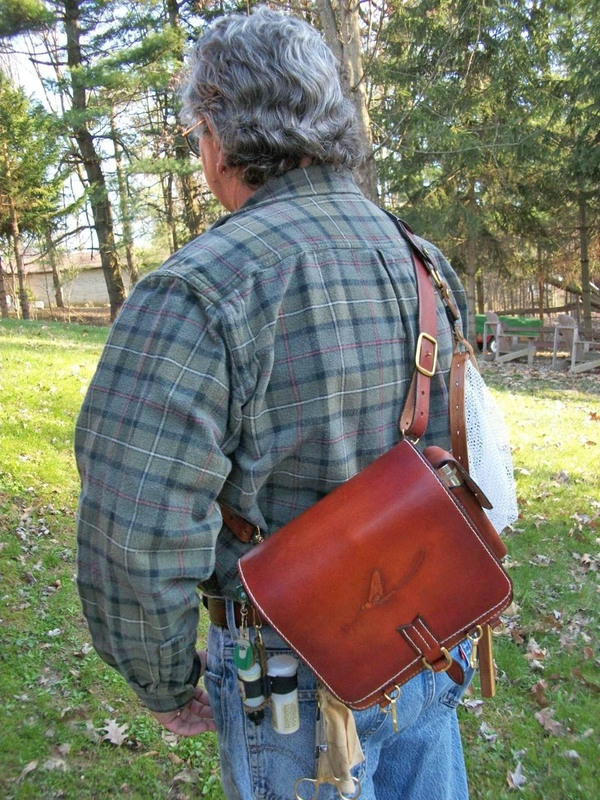 My newest design: The Mohican Streamside Bag. I've designed a new line of cases: shoulder bags for fly fishers, and I'm calling them "Mohican Streamside Bags," after my home waters in the Mohican State Forest about 30 miles south of me, where we stocked Browns. It really is a beautiful place with rugged hills and ravines and is heavily forested, and I've loved going there since I was a boy. 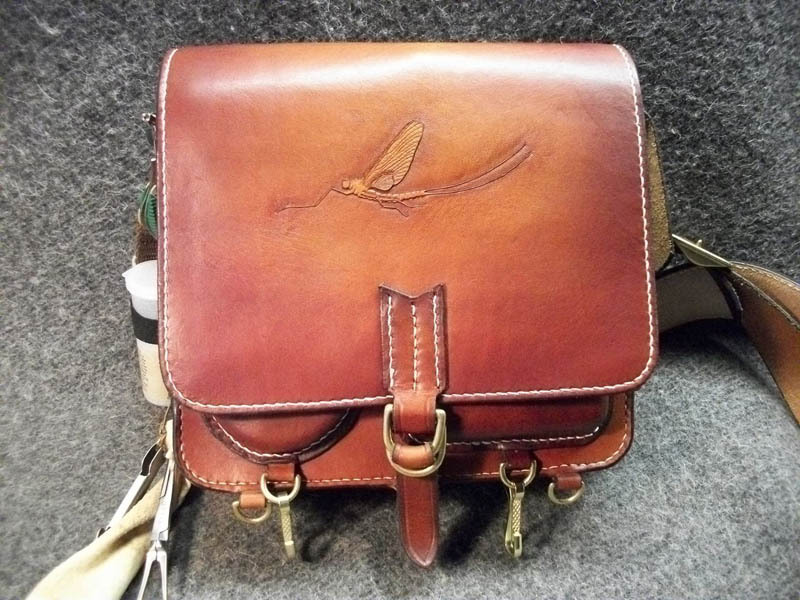 This line of bags will begin at $450 plus shipping, for a very plain, simple bag and go up, depending on size and how how many details you want me to build into your custom bag order, and on how much artwork you may want me to do on your Mohican Streamside Bag. As with all of my work, I sign, date, and number each piece. We'll discuss price when you place your order. I have made three of these bags so far, all three being different sizes. 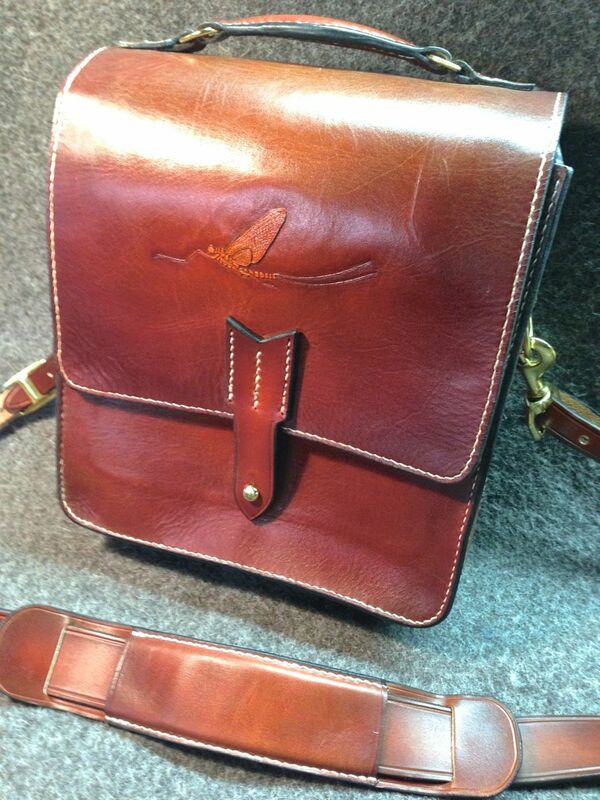 Mine, the largest so far, shown above, is approximately 9"x 9" and 3 Â½" deep and has a wide shoulder strap. I will tailor make these bags for your individual requests. And as with all of my leather work, I start from tanned leather hides and do all the making, using my own patterns, do all hand stitching and tooling, and do every step of the project by myself. Your bag will be an heirloom, collectible piece, made to your order. Note: Equipment shown in pockets, etc, is not included. I can adjust these bag designs, as far as size, inside sleeves, or pockets for your personal gear. I can hand carve (and also paint, if you like) the imagery you want: any fly, fish, personal logo, portrait, or scene with personal meaning for you. This bag, made for Elden Hinkle in late 2014, has a hand carved and painted mural on the flap, based on a photo sent by Hinkle to me. It's the same size as mine: 9" x 9" x 3.5". 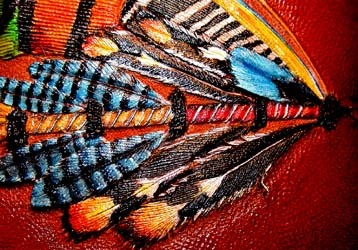 If you custom order a bag with a similarly complex scene on the flap, expect to pay around $800 plus shipping. This bag, made for Miles Tiernan, has a handle on top, besides the shoulder strap. It's the same size as mine: 9" x 9" x 3.5". A simple bag like this will cost around $500 plus shipping. This bag, made for Chris Bogart, is more narrow than the other two I've made so far. 9.5" x 6" x 3.5". It's a smaller bag, but has some nice construction details for pockets and fasteners for tools. A simple bag like this will cost around $500 plus shipping. All of these shoulder bags have different plans for pockets, dividers, and tool holders, and every Mohican Streamside bag I make will have exactly what the buyer wants. Prices will vary accordingly, starting at $450 and going up. These all have the same Mayfly on them, but you can order whatever imagery you want on yours. 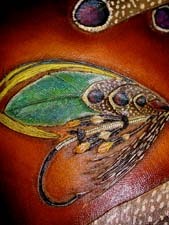 The images are drawn by me, then carefully sculpted by hand into the leather, not made with stamps. I never use leather stamps in my work. 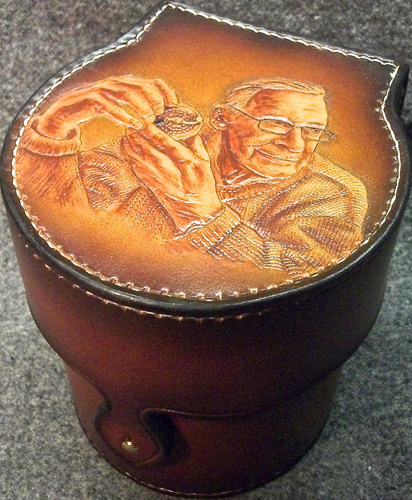 Here's the reelcase I designed for Jim Brandt, of Vancouver, WA, in 2012, to honor the memory of Stan Bogdan, designer and maker of amazing handcrafted reels. See more pix and info about this case. 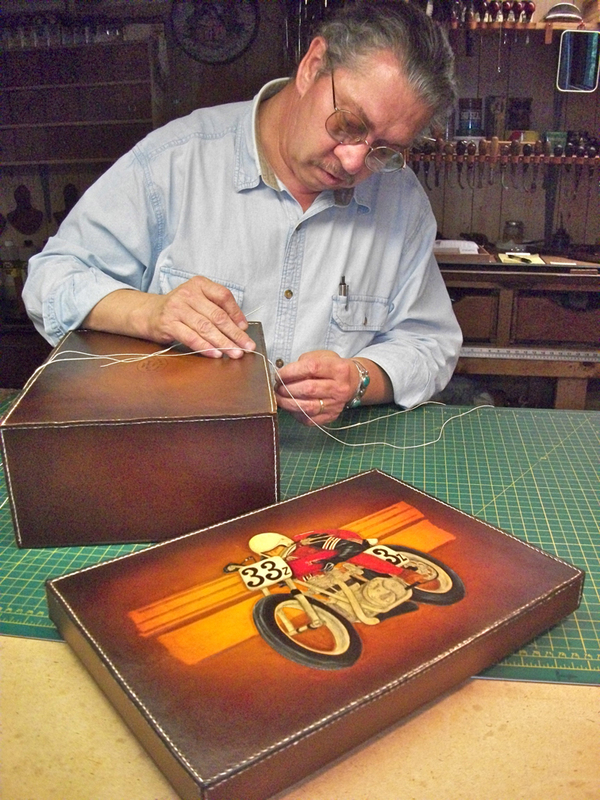 This is me sewing my leather panels onto the wooden humidor I custom made for Eldon Hinkle in June, 2012. You can see finished images of this case in my Cigar Cases page of my catalog. Introducing my new, larger fly case: the Haddock Case, for storing larger flies, such as Salmon and Steelhead flies. 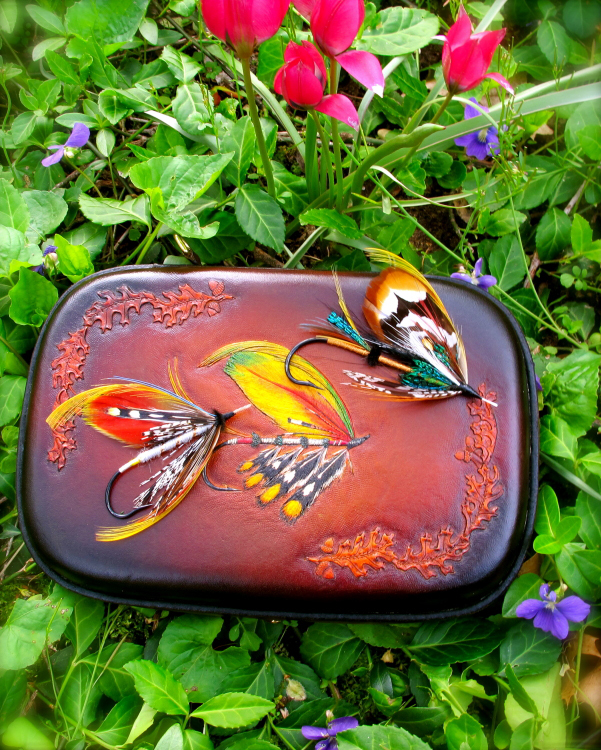 This is #1 of these larger cases, designed for Craig Haddock, who created the fly I carved and painted on the lid. 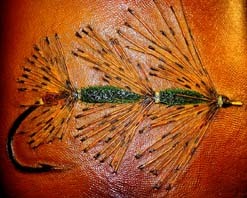 Craig took this photo and put two of his Atlantic Salmon Fly Artisan creations on it. Here's a detail of my large equipment case for Dave Gunderson of Spokane, WA. I worked with a photo Dave gave me to make this portrait, which I carved in the leather first, then painted with acrylics, as I always do. You can see several pictures of this case, which is the latest large one I've done. Large shell and equipment case for water fowlers. One of my best friends, Garry Buss of California, ordered this elaborately carved case with images of him and his choclate lab, Buster sitting in a wetlands scene, duck hunting. The Mason-Griffith Founders Collection 2007 Grand Raffle Edition included this set of three luxury custom cases by Jimmy Acord, along with five other artists' custom work made especially for this project. Above: The three custom cases Jimmy made for the Mason-Griffith 2007 Founders Raffle. The drawing was held June 2, 2007, in Grayling, MI, at the Mason-Griffith Founders Chapter Annual Banquet. Proceeds were used to conserve, protect, and restore the Upper Au Sable and Manistee Rivers. New reel case designs are now on Jimmy's Reel Cases page in the catalog. See two large images of this Gunderson double reel case design there, a new, more ornate version, made for Al Medved of Herminie, PA. Here's Jimmy's newest design: The Gunderson Case. Inside the overall case it holds two rods in their own individual tubes, with their reels attached and cushioned in shearling. See more photos and all information about this ultimate luxury case for your valuable handmade rods. Jimmy created this case for John Cella of St Louis in 2005. View images of it and one other large case design at his Fly Case page, and consider what you'd like to have Jimmy carve and paint on your own custom ordered version. 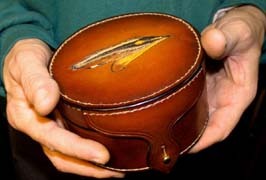 Above is a large clamshell style fly case made by Jimmy for James Brandt of Fontana, CA in late 2004. 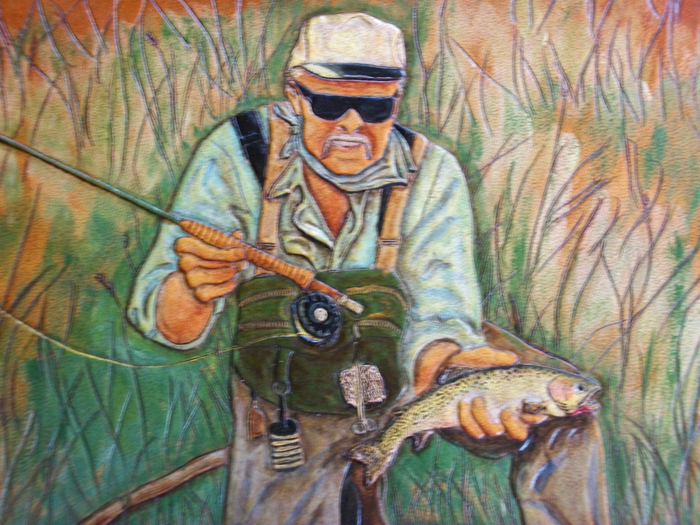 Jimmy designed a rainbow trout rising to a dry fly, a Royal Coachman. There are three initials hand carved on the back, and the inside holds Jimmy's own handmade cork strips on one side and shearling on the other. The case is 7" x 5" x 1.75". If you custom order a case similar to this one, it will cost $400. plus shipping. 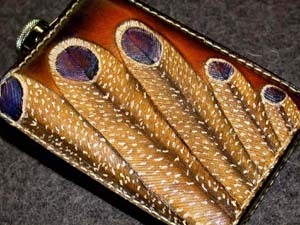 You can view more of Jimmy's fly cases in the catalog in his Fly Cases page. Sold. At left is a reel case design. Jimmy calls it his Coffee Can Style reel case. Order one made for yourself similar to this one for $350. plus shipping. Price depends on size. Cases with more elaborate carving and painting will have higher prices. Read more about it on the Reel Cases page of Jimmy's catalog. Elaborately carved cigar case created for Greg McKenzie of California. It shows a Western Green Drake mayfly resting on a bamboo flyrod. Two bamboo flyrods are carved on the bottom piece of the case. The customer's three initials are hand carved on the back of the top piece. A case similar to this one will cost $400, plus shipping. 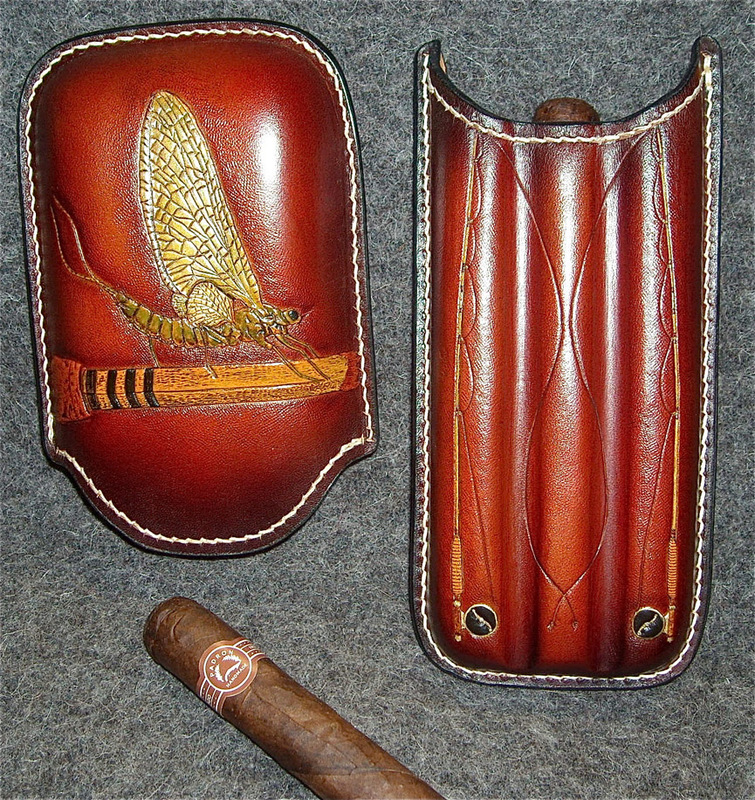 See more of Jimmy's custom cigar cases, but remember that he can make up anything you want, working with your own ideas. Sold. This flask is just an example to help inspire your order. It's the full view and detail of the front of a flask made with a hand tooled and painted Tippet Grub fly, Salmon Fly from the mid 1800s. This is a 6 oz. flask. Its back is plain, except for a hand sewn signature panel. A flask similar to this one costs $350. plus shipping. 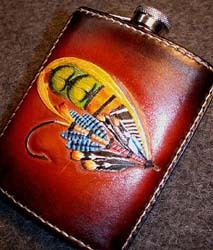 You can order anything to be tooled and painted on your hand made flask. order, including hand designed and tooled initials. Sold. Above is a 6 oz. 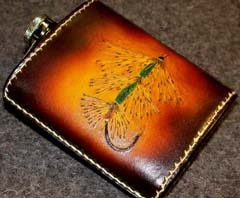 flask with tooled and painted image of a Lang Syne Salmon Fly, based on one tied by Mark Waslick.. Read about this flask on Jimmy's Flasks page. In the close-up detail picture on the right, you can see more clearly how Jimmy's tooling creates the illusion of the actual dimensionality of the feathers. His images are never stamped into the leather, but are carefully sculpted into the leather surface, before he paints it. A flask like this one sells for $350. plus shipping. Sold. 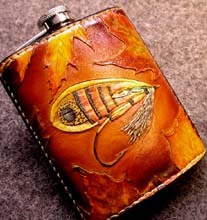 Read about this Salmon Fly with Oak Leaves flask in the Flasks page of the catalog. One ordered similar to it costs $400. plus shipping. Call or email. Sold. Above: Full view and detail of Murat Salmon Fly flask, front view. This fly was created by Paul Schmookler (famous for his original salmon flies), who gave Jimmy permission to reproduce it in leather. 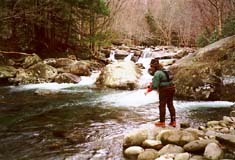 Paul and his wife Ingrid Sils are the publishers and editors of Art of Angling Journal, as well as many prestigious books on salmon flies and their materials. An article about Jimmy and his leather work appears in Vol. 1, Issue #4 of Art of Angling Journal. 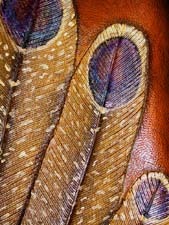 Above: Full view and detail of Murat Salmon Fly flask, back view, with Gray Peacock Pheasant feathers tooled and painted on the leather. 8 oz. flask. 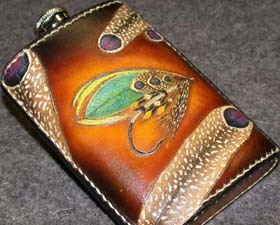 A flask ordered with a similar amount of artwork and detail costs $500. plus shipping. There is and will be only one of these. This piece is now sold. But you can order something equally elaborate, just for you. Look at some custom order flask ideas in the Catalog, but remember that Jimmy won't make another flask to look exactly like any of these. They are totally one-of-a-kind, all hand made collectibles, signed, dated, and numbered. You get to choose any images for your order, as well as any initials, etc. 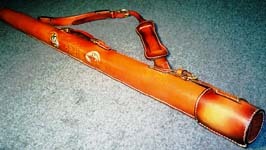 This is a design that Jimmy invented, for a combo case for carrying your rod with the reel attached. The sheepskin lining for the reel section changes to calfskin lining for the rest of the tube. Find another shot of this style of case in the Rod Case section of the catalog. This black bear piece was custom made for a Florida customer, to give to his friend to commemorate their bear hunting trip to Canada. Read about this piece and other flask designs, and order yours now. Give Jimmy a call or write him an email now! 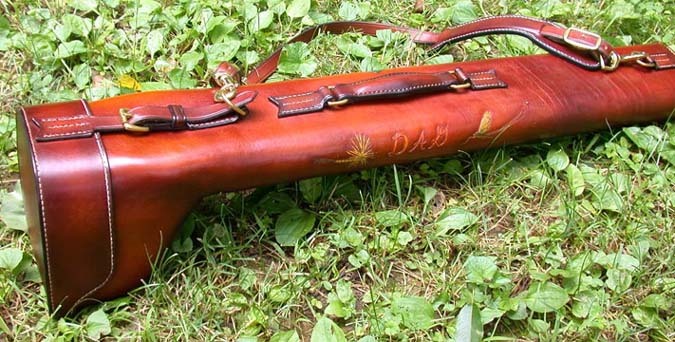 Here's one style of Jimmy's rod cases, which you can custom order. See more about them in the Rod Cases section of his catalog. Jimmy prepares to airbrush the leather dyes onto all the pieces for a shotgun shell case. It's his first design for a case for this use, and was a Christmas order one year. First Jimmy designed all the shapes to make up a paper pattern case, then transferred the shapes to a cowhide and cut them all out. Lots of planning went into this one, including research at the library, to study photos of antique cases. Sold. This is the finished shotgun shell case, made from Jimmy's pieces on the wall above. It's about 13"w x 9"h x 9"d, and has a shoulder strap. 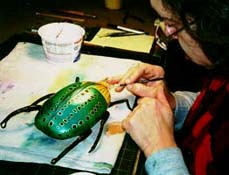 All the tooling, painting, and sewing are done by Jimmy, by hand. He made the tooled and painted portrait of Luke, the family dog of the order customer, by using their photo. The case is fully lined with dark green suede. A case like this one will cost $1,200, plus shipping. Adding more artwork, outside pouches, and / or inside compartments to the design will raise the price, but give you what you really want for your own order. As with all of Jimmy's cases shown on the site, use the pictures as a springboard for designing what you want. Well, all work and no play makes Jim a dull boy, eh? So here he is, happily fishing in The Great Smoky Mountain National Park, one year, with his pal Doug Hall, who took the photo. Jimmy ended up with knee problems for a long time, after crawling around on the huge boulders, going from one wonderful trout pool to another, but did he ever have the time of his life!!!! At left are two leather covered stainless steel pocket flasks. Jimmy has hand tooled and hand sewn these, with fly fishing designs. Signed and numbered (like all of his work), they sell for $350. each, plus shipping. These two are sold, but you can email to order yours! Adding hand carved and tooled initials or other designs to the back (which is blank on both of these) raises the price. Any imagery of this level of detail will be priced like these. 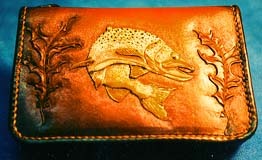 The fly case at right ishows a trout leaping, with oak leaves on either side. All hand tooled and hand sewn, the case opens to cork strips which flies are attached to. This case is sold. But you can order one like it for $400. plus shipping. Please email or phone to order. 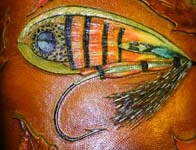 See more fly cases, rod cases, reel cases, and other examples of work to order in Jimmy's catalog. 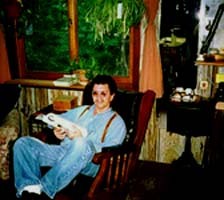 Jimmy relaxes in his studio, a comfortable place to be! Everybody needs to take a break now and then. Our dog Hattie is probably flopped in the other chair. Putting the final touches on"Beetle Juice," a functional whiskey flask. 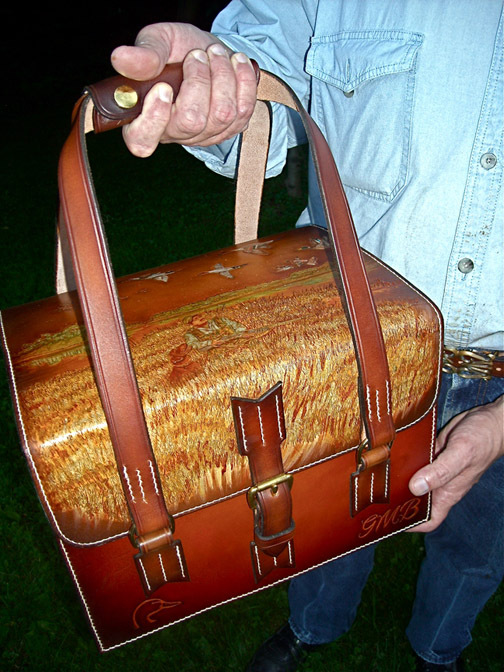 See it and more unusual leather objects that Jimmy has made, in his Gallery. 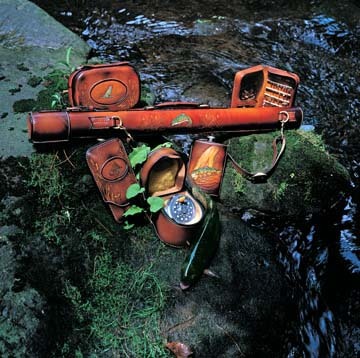 This photograph was taken by my friend Stewart Simonds in 2004 at a private trout club in Ohio, for the Weaver Leather 2005 calendar. (I buy all my leather from them. They sell the best tanned leather in the country and have grown into a big international company.) The cases in this photo are ones I made for myself. Stewart caught a live rainbow trout and placed him in the setup, next to the reel case and took many photos within a minute or so. A dragonfly landed on the fly case in the top right corner, and this shot resulted. The trout was released and swam away fine. Sadly Stewart passed away at 56 on April 5, 2005. He was a metal sculptor, a professional photographer, charter fishing business owner, and super nice man. Very sadly missed by all who knew him. A very long and detailed article about Jimmy and his leather work appears in Vol. 1, Issue #4 of Art of Angling Journal, a magazine which sadly is no longer being published, but the article is still on their website. 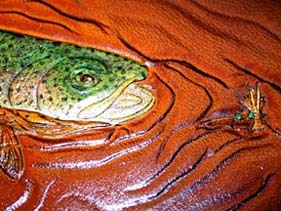 James Acord's Leather on TV: Jimmy was featured on a program on the Outdoor Life Network in 2005. The program is still being periodically rerun, so hopefully you can see it. Many thanks to the Ohio Arts Council, for awarding James Acord an Individual Artist Fellowship in Crafts for 1998. Web site design © Susan Shie 1997-2019. Site opened October 15, 1997. Made now on a 2017 Apple iMac, using Dreamweaver.